Plastic Bold – an unparalleled branding area with a slick capless design. First things first, how would you sum up the design? Big and Bold. A premium feel solid plastic body is complimented by a metallic outer shell which allows you to seamlessly push out the USB connector for use or pull it in to protect it when on the move. Practically the whole of each side of the USB body is brandable which means it ranks only behind our Business Card USB Flash Drives for branding area. 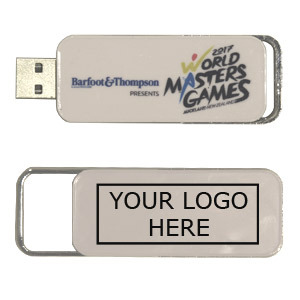 It’s a great option for any business but we often recommend this model to our clients with a particularly detailed logo that won’t necessarily be printable on many other USBs. A lot of our clients also look for a capless design as there’s nothing worse than losing your USB lid! It’s not for everyone though, it’s large and fairly heavy. While these are both positives for many people some are looking for the smallest possible USB to attach to a keyring. How does it feel in your hand? At 63 x 25 x 13 mm it’s on the larger side (as mentioned above), the edges are slightly curved but it does feel robust and solid in the hand. As standard the Plastic Bold USB comes with the USB connector hidden inside the main body. To allow the memory stick to be connected to a device you simply push the metal section at the back in and you’re done. Then simply pull the metal clip backwards to conceal the flash drive connector again. What makes this Model different? The USB branding area. It’s the largest in our extensive range (Business Card models excluded) and that’s why it’s a favourite for so many businesses. It can be screen printed or full colour printed allowing the those particularly complex or detailed logos/designs to be shown in their full glory. I’d recommend this model to anyone looking to really stand out. There are more popular models out there, there’s smaller memory sticks, different materials and styles but the Plastic Bold is always worth considering for your promotional flash drive solution. If you want a robust, stylish USB that is sure to wow your clients then look no further, click here PLASTIC BOLD USB FLASH DRIVE for a quote today!